PayrollPanda — What is the difference between the leave policy types? Help Center Home App What is the difference between the leave policy types? What is the difference between the leave policy types? 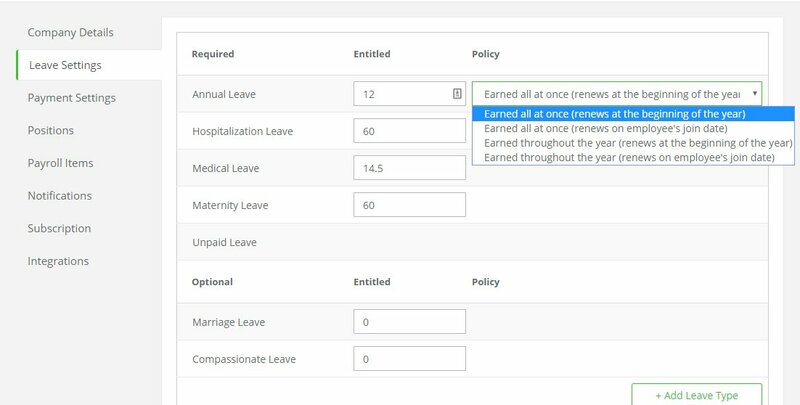 We have four types of leave policies in our app for you to choose from. Making changes to the leave policy can be done under the Leave Settings. The employee will earn all remaining prorated annual leaves based on their join date. For example, if the annual leave entitlement is 12 days, and the employee joined on the 1st of July, then they will be entitled to 6 days of annual leave. It will be renewed again at the beginning of the following year. This is the same as the first type except that the leave entitlement gets renewed on the employee's join date, i.e. their anniversary. The employee will receive their leave entitlement in parallel with their working period. For example, if the annual leave entitlement is 12 days, the employee will be entitled to 1 day annual leave per month. Their leave entitlement will accumulate in the subsequent months, so if an employee starts on Jan 1st and has not taken any leave after 4 months of employment, they will have accumulated 4 days by the end of April. This will get renewed at the beginning of the year. This entitlement policy is the same as point 3., the only difference being that it gets renewed on the employee's join date instead of the beginning of the year. Can I get an app walkthrough or demo of PayrollPanda? Is PayrollPanda a free, trial, paid, freemium or premium app? Why is my PCB calculated as 0 or less than what is expected?